That is one of the best Deathrattle effect for a taunt, if not the best. Balanced card, can't say its OP or bad. Balanced cards not always see play. This is the card that makes Resurrect Priest work in the standard meta. Hellll yeah. This is what Shellraiser should have been to see play. 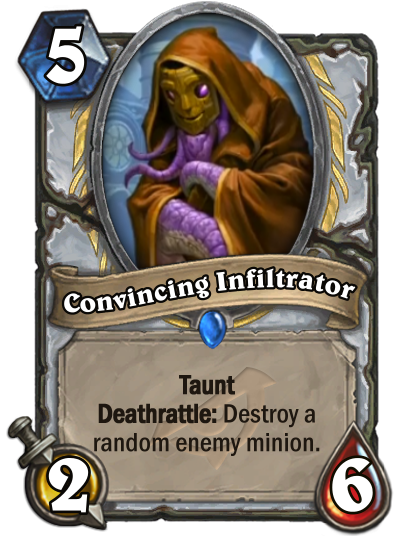 I would be shocked if this didn't make it into a lot of Priest decks. Obvious synergy with the new 2/2 as well. Convincing Infiltrator? Why is their a priest card infiltrating the evil league? I thought Priest was one of the bad guys! "Let me change your mind." "Let me change your mind." "Let me change your mind." "Let me change your mind." Naw man the bad guys are infiltrating the good guys ya silly. This card is better than Statue in every deck except Rez ones. Very convincing.. you can totally can't see it's a faceless.. good job madam lazul. Destroy random enemy minion is heavily undervalued for some reason, (opinion ahead) it is only fine on Deadly Shot because it expends a card from hand, has limited free cheat/recast options and doesn't handle board of tokens well. Wish they'd stop putting this effect on minions because it punishes midrange/control decks that can't pump out tokens to cover their threats. But they had to print it to make Catrina Muerte shine I guess. Wow, obsidian jr. is going to be in a LOT of priest decks. It's good on it's own. So either your opponent has a bunch of small minions where the 2 attack does good work, or they have a few big minions where the deathrattle is really good. I guess it's not as good against a bunch of big minions, but that means you probably lost anyway.